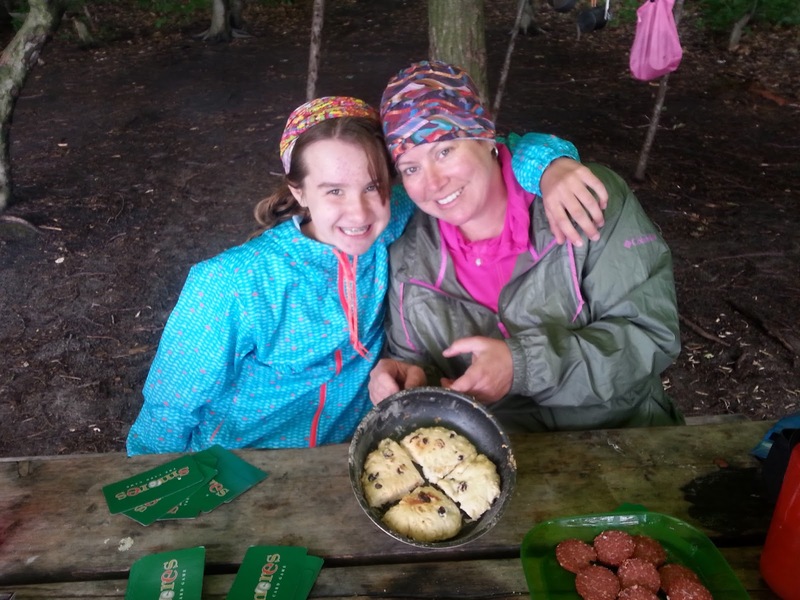 We decided to try baking with a reflector oven on our recent paddle-in trip to The Massassauga Provincial Park. Almost all of the food we packed for the trip was dehydrated, and most of it was prepackaged meals we bought from an outdoors store. So, the idea of freshly baked goodies to compliment our meals or have as a snack had us very excited. Backcountry baking is a great activity to do with kids. Emma was a great helper and really enjoyed helping out with each baking project. Here we are with a beautiful bannock loaf. 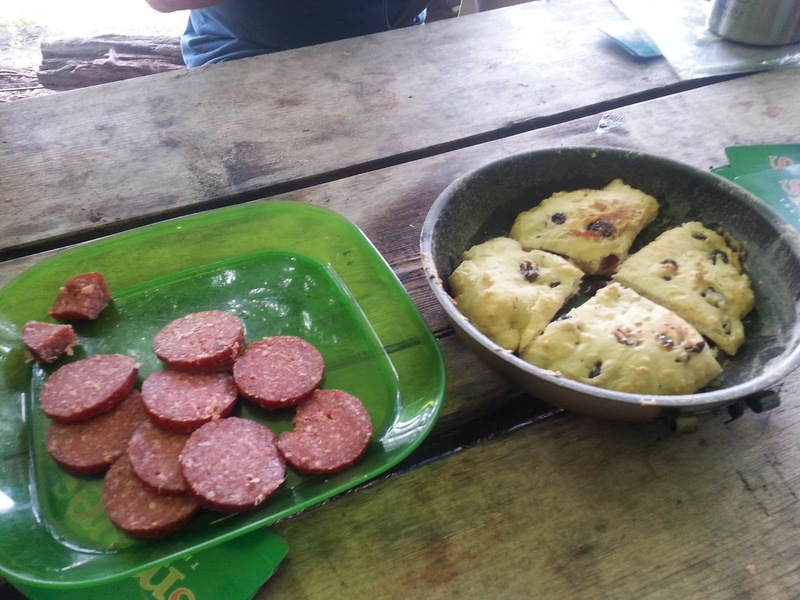 I decided to try three different things on the trip – pizza crust, biscuits and bannock. All of these items are easy to prepare at home, with water being the only additional ingredient added on the campsite. At least, that’s what I thought when I was on the campsite. More about that in a moment. I’m all about easy baking, so I chose recipes with minimal ingredients. In fact, I totally cheated with the biscuits and used a popular store-bought baking mix (that starts with a Bis and ends with a Quick) instead of figuring out my mix from scratch. I used Ontario outdoorsman and author, Kevin Callan’s bannock recipe with a slight modification. And for the pizza dough, I went with the recipe found on the back of the Pizza Yeast packaging. My first baking attempt was the pizza crust. It seemed like a good idea when I was preparing the ingredients at home. But I made a critical newbie mistake and didn’t write thorough instructions on the baggie containing the dry ingredients. As I added the water and started to mix everything together, I knew something was wrong. And I kind of panicked. In the end, I had a sticky, gross mass of dough that didn’t resemble anything close to a pizza dough. So in fine form, I had a tantrum worthy of any 45 year-old woman and walked away from the entire production. Alex went ahead and cooked the doughy mass (which Emma declared looked and smelled like play dough) and we ate it as a snack. It turned out kind of like a weird bannock. While the dough was a flop, the oven worked great and I was encouraged to try something else another day. What went wrong? Upon reflection (ha! ha! Get it? Reflector Oven…. reflection?) I came to the conclusion that I forgot to add the yeast, and that I definitely added too much water to the mix. I’d like to say that now I know better for next time. But to be honest, that pizza dough irked me so much I’ll probably never try it again. I know – mature. Right? Dinner wasn’t a complete loss, though. Luckily, we had a good supply of tortilla wraps, so I made “Italian” quesadillas instead, using the shredded cheese and pizza sauce intended for the pizza. I baked these in the reflector oven as well, and they turned out great. My second attempt at baking with the reflector oven was the biscuits. They were awesome! They turned out a beautiful golden brown and were light and fluffy on the inside. I went with a drop-biscuit style to keep things easy. Our little pan held enough dropped dough for five or six biscuits. To prove that the first batch of biscuits weren’t a fluke, I baked them again a few days later and again they turned out great. The biscuits are just starting to brown. Take note of where the fire has been built, and the flat rock that the oven is sitting on in the pit. My third attempt at baking was bannock. Real bannock, not pizza-dough-gone-wrong bannock. I added dried cranberries to the mix for a bit of variety. It also turned out great, and had us wishing we had more when it was all gone. Bannock with cranberries and “Camper’s Sausage” we picked up from the Guelph Farmer’s Market. This was an awesome lunch the left us wanting more! I couldn’t believe how well the reflector oven baked these items, in a quick amount of time and with almost no effort. We have the Svante Freden reflector oven, which we bought from The Canadian Outdoor Equipment Company. It’s a clever design that allows it to be folded flat and be easily transported in our food barrel. Standing folded, but upright and didn’t take up any significant room. The one drawback to the design is that it has sharp points when it is folded flat. I made sure I packed our stuff around the oven carefully, to avoid it piercing any food packaging. This would be an even bigger concern if the oven was being transported in a backpack or drybag. The size of the oven may also stop us from packing it for a backpacking trip. It isn’t heavy but it is a bit large even when folded and has a bit of an awkward shape. It’s easy to assemble on site. I really like that it has a rack on the inside for the pan, and a handle on the top of the oven that makes it easy to lift out of the fire pit. One word of warning, though… the oven is really light and the opening is quite wide. Which, apparently, makes it easy for the pan to slide out if you aren’t careful. It’s all fun and games until somebody drops the biscuits. Thank goodness for the 10 30 second rule. Build your fire in one small area of the pit, so you can put your oven close to the flame but have it as flat as possible. If there is a flat rock nearby, use it as a small baking rack to hold the oven in the firepit. Check on your baking regularly. We found that turning the pan at least once while baking helped everything bake evenly. Be careful when you move the oven from one place to another. Stuff falls out easily. It is best to tip the oven backwards a tiny bit while carrying it, to avoid unfortunate accidents. Invoke the 10 30 second rule as needed. Despite the pizza dough incident, I’m now hooked on baking in the back country. It was a great activity to do with Emma and the smell and taste of fresh food in the outdoors is irresistible. The Svante Freden oven is going to be a staple on our gear list and I can’t wait to try out some new, different recipes on future trips. Do you bake at the campsite? What is your favourite recipe? I love our reflector oven! So far we've baked a birthday cake in the backcountry of Algonquin, corn bread, muffins, and bannock. They all turned out great!